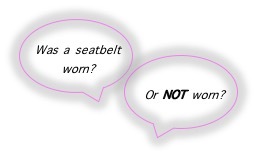 Have you ever wondered how many children’s lives are saved in car crashes by the use of a correctly fitted car seat in the UK? In our line of work, we’d love to know the answer too – but would it surprise you to know that it isn’t actually recorded? Following a road traffic collision and depending on its severity, a record of what they find will be taken by the Police – this is often referred to as a Stats 19 form. It may then ask the age of the casualties or even better the date of birth, it may even ask where they were sat in the vehicle. And if so, was this independently confirmed ( in other words did the passenger claim they were wearing it, and someone else can confirm this!) or is it actually unknown if they were wearing a seatbelt at all? Does make you wonder why not, doesn’t it? Sadly, we really don’t have an answer to this, only speculation. But what we do know is that this doesn’t help us convince the media, the powers that be and parents how important a child seat is in saving lives. It also means that sometimes media hype, myths and assumptions can be created based on half a picture. This sounds serious, but when you see the fuller picture, these headlines are based on the data taken from the UK’s Department for Transports statistics, which are collated from the Stats 19 form, (which don’t record enough info’ in the first place). However, this data also groups all child road users together ….. When you break this down, children injured or killed just in vehicles is on average about 39% of this total figure. It also groups all children from birth to 15 years. So that can include young people aged 12 upwards, who by law, wouldn’t need a child seat and doesn’t exclude those involved in illegal activities. Please don’t get us wrong, any infant, child or young person killed, seriously injured or even just slightly injured on our roads is not good. But in order to compare the UK’s attitude towards car seat responsibility and behaviour against other countries and potentially learn from what they do, needs us to compare the same data. If the 45 Police forces in the UK don’t record all the same data, how can we compare our casualty statistics to other countries? So when you read that other countries have better child safety ratings than us, ask yourself what’s that claim based on? For example, a lot of countries don’t have roundabouts, so they will have less side impact collisions than perhaps we do. They could have smaller populations, fewer vehicles, lower speed limits, different road traffic laws. Based on what we do have and you start to measure like for like, we’re actually doing good! Not Great – otherwise we’d have no injuries at all – but we’ re definitely doing good! Please be careful what you read, especially on parent to parent forums before you follow someone else’s advice as it may not always be correct or based on legitimate facts. 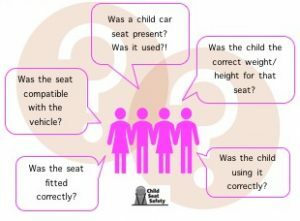 At Child Seat Safety, we have been collating and studying our car seat checks for many years and we started more recently to specifically break down the findings to establish if it was just the child that was fitted correctly into their seat, but the seat was fitted in to the car wrong, or was it just the seat that was fitted correctly and the child wasn’t? or was it both child and seat are fitted incorrectly. We don’t just stop there because we also record when there was no seat being used when they legally needed one and 30 + other faults that we commonly see. These results come from our Community check events as well as Police enforcement events, where its not an option to have the seat checked, it’s by request of the Police officers stopping the vehicle and therefore this gives us a good cross section of the population and a realistic overview of car seat usage in the UK. We are starting to see an improvement in the way car seats are being fitted, thanks to the intuitive designs, better instructions, good training and publicity. This is great news, but we still need to see a greater improvement in how many children are incorrectly fitted in their seats, so this is where we will be addressing our work in the future. Everywhere you look on social media statistics are quoted and can scare us, twist the truth or provide out of date and incorrect comparisons, But then surely it can be used for some good stuff? Including those bits of information that are tips and life hacks that will help keep our children safe.